At the same time, however, even as Railway Minister Nitish Kumar explained that trains were a “vehicle of connectivity”, not a single additional service has been introduced to connect other metro cities apart from Delhi. 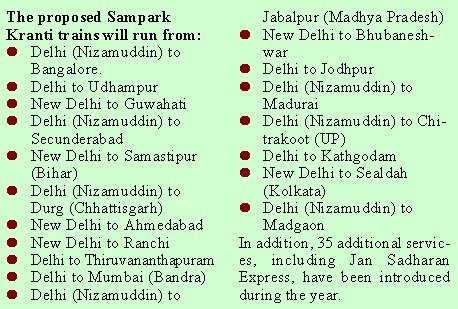 The Sampark Kranti trains will run non-stop beyond the geographical boundaries of states with value-added features. These will be equipped with a public address system. The first train of this series — the Karnataka Sampark Kranti Express from Delhi (Nizamuddin) to Bangalore (Yashwantpur), will start running from February 8. While it will initially run as a tri-weekly train, it will be made daily from October 2.